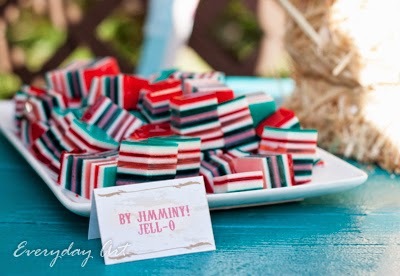 I am getting a real thing for striped Jello! I made these last year for St. Patrick's Day and thought I'd share them with you now! Making striped Jello is crazy easy and a real fun surprise. For these, I just used the same recipe I do for rainbow Jello, but mixed it up by using only greens. I added some of the white layer into some of the green for a light opaque green, then I used white grape juice and gelatin for a clear-ish layer, then I also mixed in some blue to some of the green for a dark turquoisy-green. (Go easy with the blue! I just threw out most of what was left of it.) And, of course nice good ol' green jello. Here is the master recipe for rainbow Jello.